Cold Sweat Records is proud to announce we will be re-issuing the amazing psych opus "Penetration, An Aquarian Symphony" by The Ya Ho Wa 13 this winter 2008. For those un familiar.....Harkening back to 1972, time of the cult-occult-commune explosion. By day, the Source Family served organic cuisine to John Lennon, Julie Christie, Frank Zappa and others at the famed Source restaurant. By night, in a mansion in Hollywood Hills, they explored the cosmos through the channeled wisdom of their charismatic leader, Father Yod. 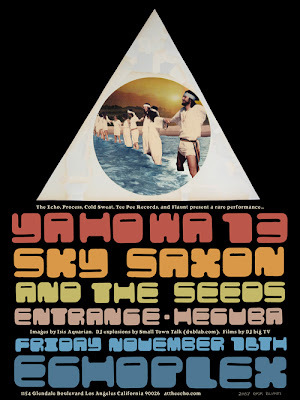 Father was an outlandish figure who had 14 “spiritual wives,” drove a Rolls-Royce, and fronted the rock band Ya Ho Wa 13, now considered by collectors to be one of the most singular psychedelic bands of all time. In conjunction with the launch of the new Process Media book The Source: The Untold Story of Father Yod, Ya Ho Wa 13, and The Source Family by Isis Aquarian, the author and a dozen original Source Family members from the legendary LA cult/commune will mark a return to Los Angeles in early November for rare live performances and book signings.